Democrat Patrick O'Donnell currently represents Assembly District 70 and will not be termed out until 2026. O'Donnell is expected to easily win re-election in 2016. In November 2014, Patrick O'Donnell was elected to the California State Assembly. 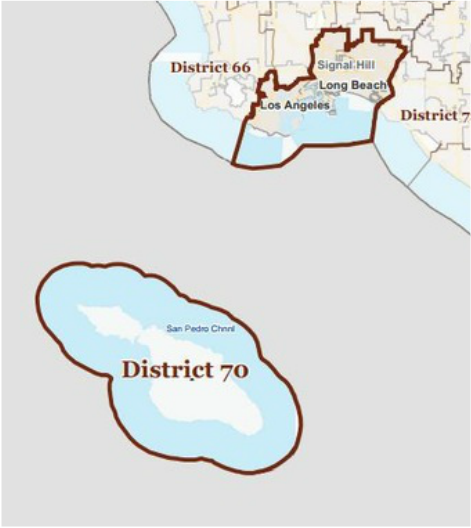 He represents District 70, which includes the cities of Avalon, Long Beach Signal Hill and San Pedro. Assemblymember O'Donnell was a classroom teacher for nearly 20 years and served as a member of the Long Beach City Council. A leader dedicated to quality education, O'Donnell helped create a program at his high school to provide students with more instructional time. He also lobbied in Sacramento for more school funding. While on the Long Beach City Council, he helped produce the city’s first budget surplus in over a decade. He helped establish a "Rainy Day Fund" policy that requires City Council to save in anticipation of tough economic times. He also secured funding for police gang-unit officers and brought crime to its lowest level in 41 years. O'Donnell worked to raise awareness about human trafficking by introducing legislation to ensure tougher penalties for convicted of the crime. Foster care is another issue O'Donnell has tackled. He led an effort to found the Palace Hotel Project, which converted a former hotel into housing for kids "aging off" of foster care to provide additional support. A firm believer in ensuring access to career technical education and vocational opportunities, he helped establish an afterschool digital academy to teach kids valuable media skills they can use in school and the workplace. Born in Long Beach, O'Donnell graduated from California State University, Long Beach with a degree in History and a Master's Degree in Public Administration. He lives in the Los Altos neighborhood with his wife and their two daughters.